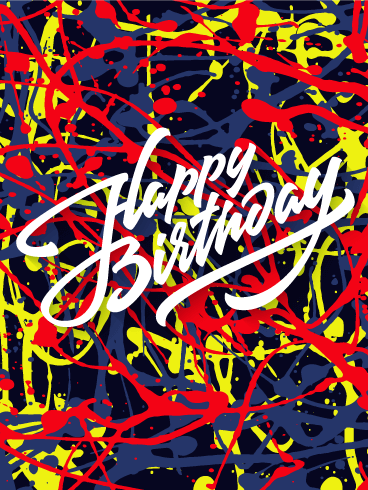 This birthday card is a great choice for the artist in your life, or for anyone who appreciates funky, abstract art. After all, take a look at those colors! The paint splatter adds an element of fun, while the graffiti-looking font plays right into that theme. Whether you're celebrating a significant other, child, friend, or relative, this birthday card is the perfect choice. What better way to tell him "happy birthday" than with this glamorous birthday card. It's all of the glitz and glamour of gold on black. He will be in awe of the statement this stunning birthday card makes. This birthday card has a celebration written all over it, and he will be thrilled when he receives it in his email inbox. 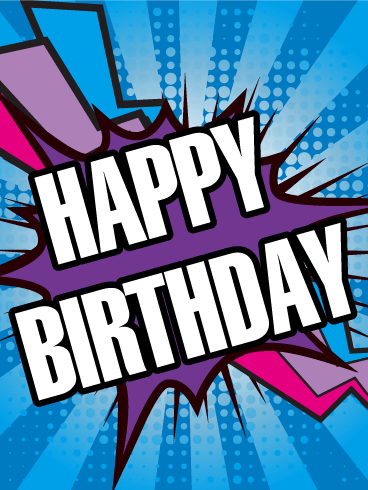 Nothing says "Happy birthday" better than a bright card with a funky font. 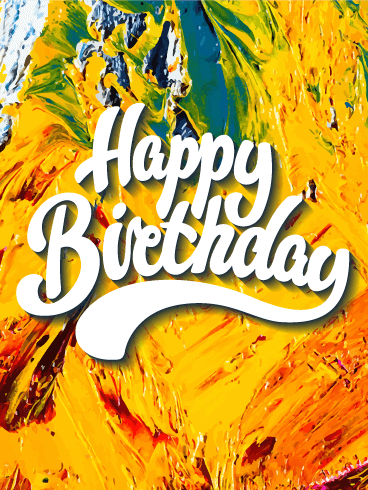 The design on this birthday card is abstract and captivating, with a variety of colors for every taste and style. It's perfect for anyone who's celebrating their birthday. Just look at the groovy writing of the words. What's not to love with this fun and fabulous card?! If you're looking for a birthday card that takes you right to Hollywood, this is the card for you. The shining stars are captivating without being over-the-top, and the balloon-like letters of "Happy Birthday" are a fun touch. The "bright" pun is also an added bonus, making this birthday card the perfect combination of elegance and fun. 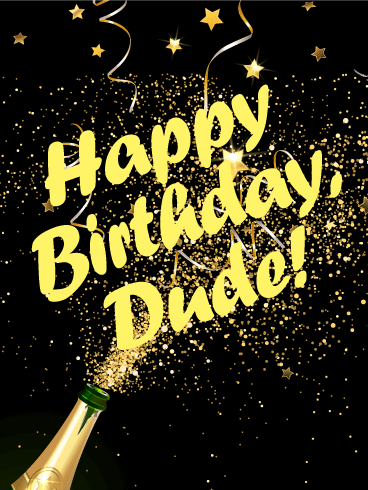 Happy Birthday, Dude! This birthday card is like one big celebration for Dude. A bottle of Champagne pops with a burst of gold confetti against a striking black background. The message in front is big and bold, wishing an all-around awesome dude a very happy birthday! Whether you'll be celebrating together this year or you're sending your best from far away, this birthday card is one sure to get Dude in the mood for a party! 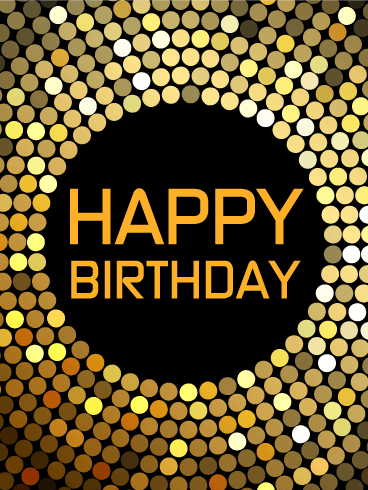 This striking black and gold birthday card is a wonderful way for you to wish an equally wonderful man a very happy birthday! Sprinkles of sparkling confetti surround the message, which is front and center for him to see as he celebrates another year. No matter what your relationship, this thoughtful card will certainly make him feel remembered and loved. Do you know a birthday boy who burst into your life and created a special place in your heart? 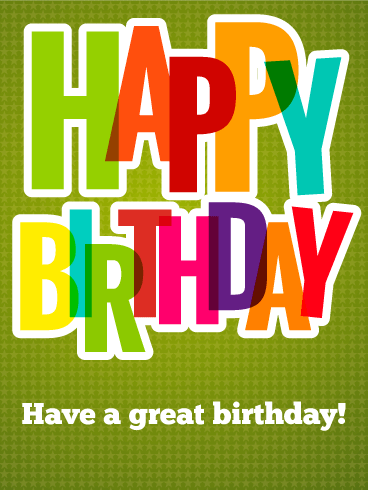 Tell him how much you love him by sending him this exciting Happy Birthday card! The "Happy Birthday" message explodes onto the card, much like your brother, friend, husband, or son burst into your life when he met you. 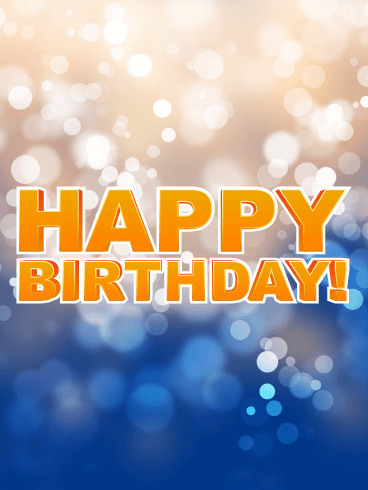 Celebrate his life by sending this birthday card and a sweet message on his special day! If you know a special guy who has been with you through the good and the bad, you have found the perfect card to celebrate his birthday! This Happy Birthday card feature lights shining through gold and blue, just as your loved one brings light and happiness through good times and bad. 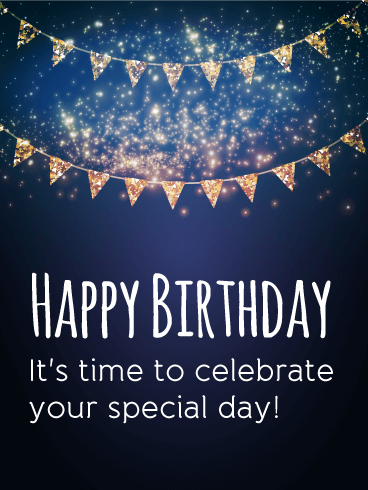 Let him know how much you appreciate him by sending this birthday card to celebrate his special day! 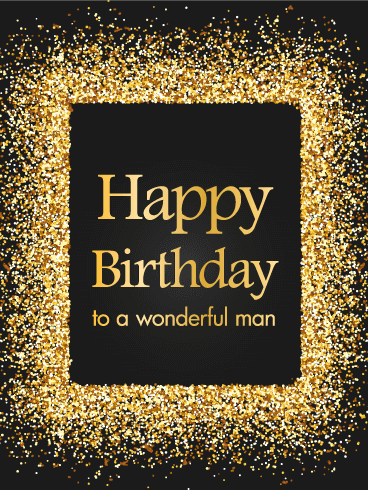 If you know a classy man who is celebrating one more trip around the sun, use this beautiful, sophisticated birthday card to send your birthday wishes! 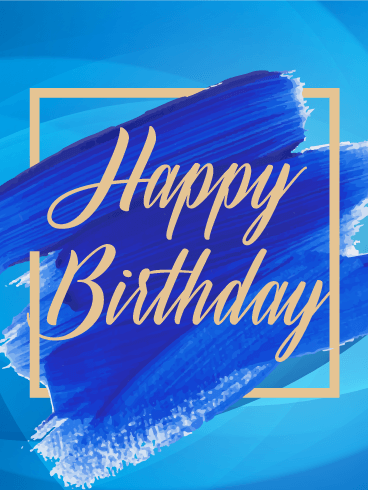 The bold blue paint strokes, blue background, and gold accents make this card perfect for any birthday celebration. Say "Happy Birthday" and show your favorite man that you care about him on his special day! Birthdays are the one day a year when everybody can be a star in their own lives! If you know a birthday boy who deserves to be celebrated on his special day, send him this Happy Birthday card! 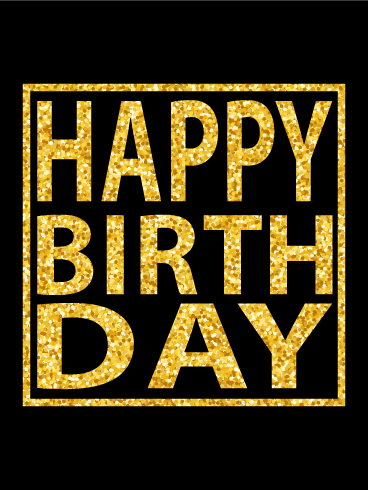 The "Happy Birthday" message is written in sparkling gold font and stands out against the dark background, the same way your loved one shines out in life. Send it today! Do you know a fabulous person who is celebrating a birthday soon? 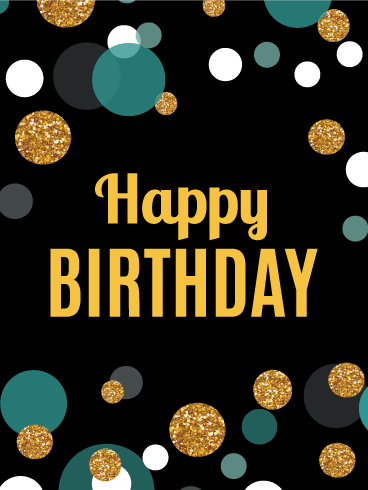 This bright, sparkling Happy Birthday card is the perfect way to send your birthday wishes! The glittering gold background and swirled font will show your loved one just how amazing you think they are. 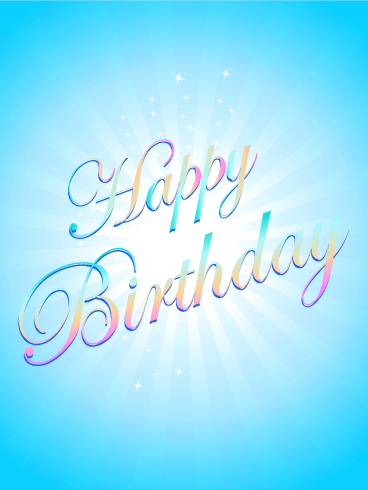 Use this beautiful, shining birthday card to send birthday cheer to your friends and family today! Surf's up! Nothing beats the exhilarating thrill of catching the perfect wave. The only thing that comes close is celebrating the best day of the year - your birthday! 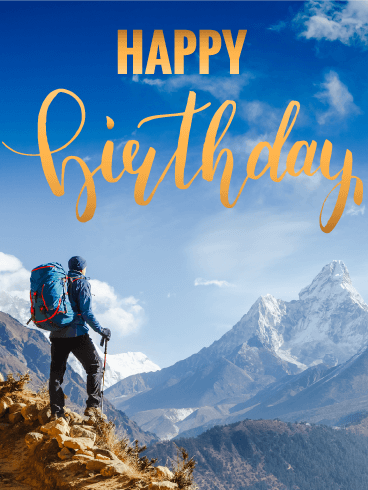 Help your loved one experience the joy and excitement of an amazing birthday celebration with this adventure-filled Happy Birthday card! 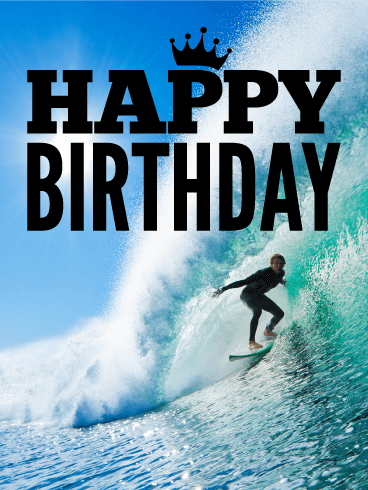 All ocean-loving thrill seekers will see this birthday card and have the best birthday ever! Do you have an adventure-loving friend or family member who is celebrating a birthday? Do you want to give him a Happy Birthday card that is as thrilling as he is? Then you've found the right one! 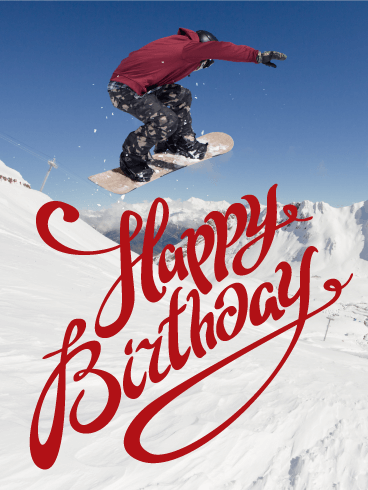 The high-flying snowboarder and snow-covered slopes will be a great fit for your loved one and help him have the best birthday ever! It's time for a sophisticated birthday celebration! 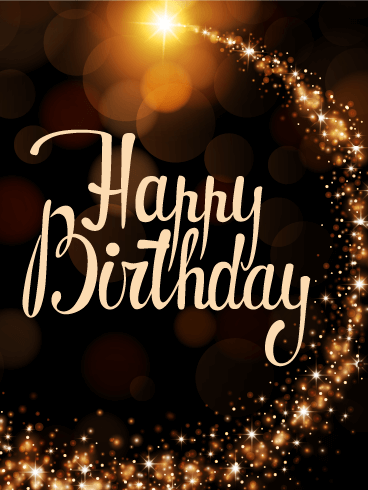 Give your friend, coworker, or family member a great start to their birthday by sending them a beautiful Happy Birthday card! The blues, blacks, whites, and glittering golds offer a classy look, making this the perfect card for a classy person. 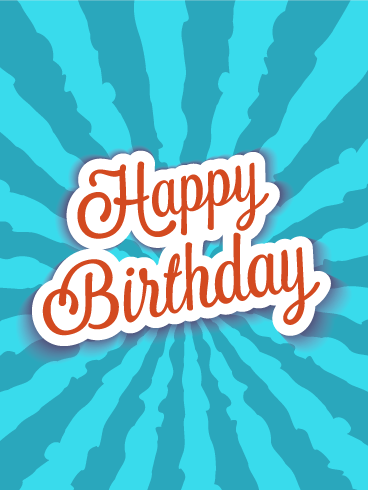 Send your birthday wishes with the colorful dots on this card today! Hiking through forests and mountains can be an exhilarating and inspiring experience. When you reach the top of the peak, you feel like you can conquer anything! Help your birthday boy feel this thrilling feeling by sending him an adventure in a birthday card! 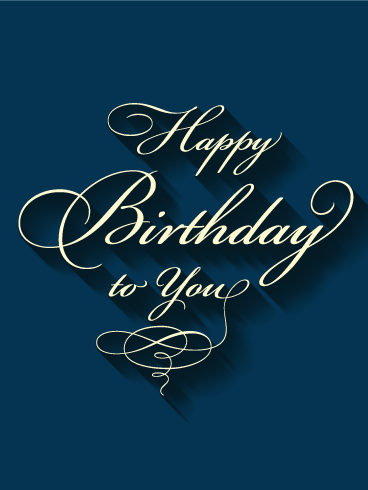 This Happy Birthday card will make him feel unconquerable and give him an incredible birthday this year! Do you have an artsy friend or family member who is celebrating a birthday soon? If so, they will love the designs on this Happy Birthday card! 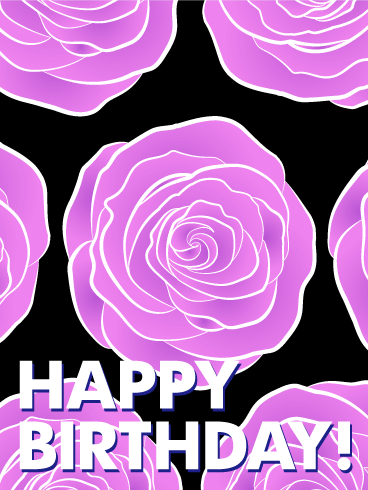 The lines and swirls that create the purple roses will catch their artistic eye and give them a card that inspires them. 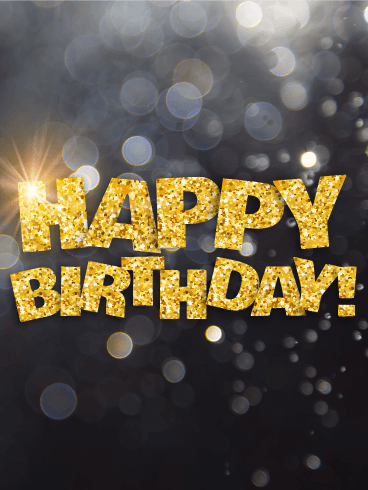 Send this birthday card and a sweet message to give your favorite artist the best birthday ever! Birthdays are the perfect time for a groovy dance party! This birthday card is the perfect gift for the fun-loving dancers in your life! The gold, white, and brown circles glitter and form a music record on a black background, the perfect accessory for a night of celebration. Say "Happy Birthday" and "Let's dance!" 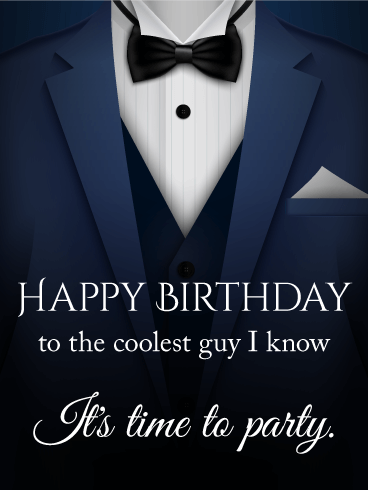 to the party lover in your life with this awesome birthday card! When you turn down the lights and light the candles, you know it's time for a birthday celebration. 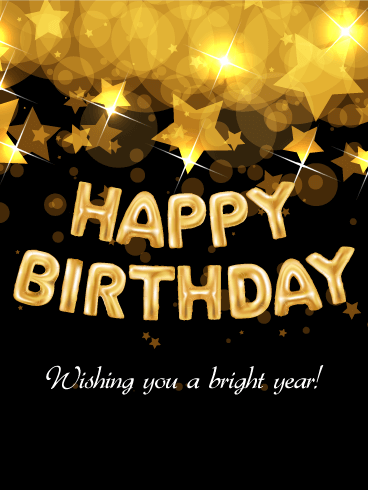 Use the magic lights on this happy birthday card to wish your friends and family a happy day and many more to come! 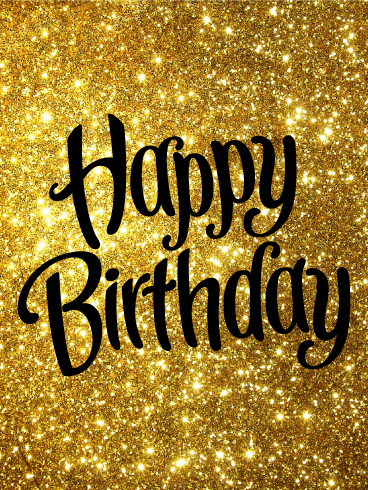 This birthday card's fancy writing on a dark background with amber and gold lights and sparkles will make this the perfect birthday! Grab your ribbons, hang your pendants, and get ready to celebrate! Show your birthday excitement by sending this birthday card to the special people in your life. The glittery pendants and bright sparkles bring a starry night sky to mind and set the mood for a fabulous celebration! This happy birthday card says "Happy Birthday! It's time to celebrate your special day!" and shows how much you care! Everyone knows someone who's an optimist. They don't sweat the small stuff and they always look on the bright side of life. They have a great sense of humor and they don't want some stodgy birthday card. No gray-scale and stuffy font for them, please. Give them bold, bright rainbow lettering and hey, put it on a star background, if you can. That's why you give them this birthday card, because like them, its glass is always half-full. A cool, blue birthday card that really rocks. The electric blue storm that ignites this birthday card is fun, funky, and fitting for any person! If you want to send a hip birthday card, this is the one for you. This card shines just like a birthday person's smile. Let's make the smile shinier and make the birthday a brighter day.